I have heard of Saltine Cracker Toffee, but I had never tried it until now. I can't believe I waited so long. You might as well call this "crack"! This stuff is SO addictive. We both could not stop eating this stuff. it tastes like toffee; you can't detect the saltine cracker. It just adds a little crunch. 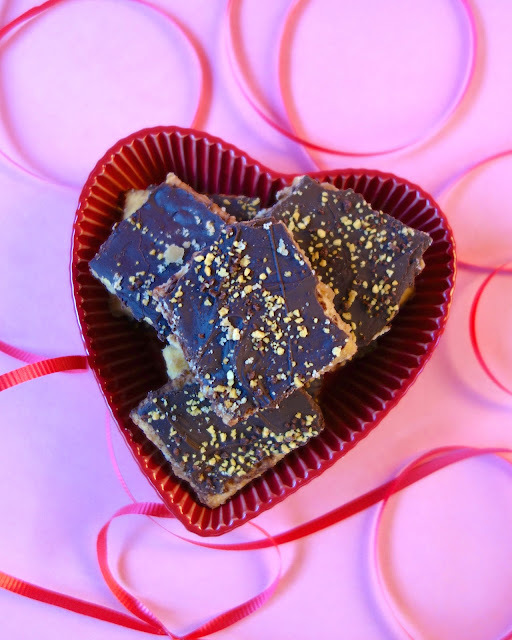 This is an easy treat to make for friends, co-workers, neighbors or classmates for Valentine's Day. Just whip up a batch of this and pop it in a cute clear bag with some ribbon. I promise everyone will love it! Line a 9x13-inch pan with aluminum foil. Line pan with saltine crackers in a single layer. In a small pot combine sugar and butter. Bring to a boil and continue boiling for 3 minutes. Mixture should be a deep caramel color. Immediately pour over saltines and spread to cover crackers completely. Bake for 5 to 6 minutes. Remove from oven and sprinkle chocolate chips over the top. Place back in oven for 1 minute. Remove from oven and spread melted chocolate chips over crackers. Top with chopped nuts. Allow to cool and break into pieces. I make this with graham crackers instead of saltines, it is TOTALLY addicting!!! I've decided to pin your recipe. I love this, but have not had much success making it in the past. Perhaps your recipe is slightly different and will be a success for me! I think the secret is to make sure it comes to a full rolling boil before starting the 3 minute timer. If it's at a full rolling boil the stirring does not make it stop boiling. Hope that helps, Barbara! We make this at Christmas time but replace the nuts with crushed candy canes. So good! Mmm....I love this stuff and it is super easy. I usually top it with a combo of chocolate chips and peanut butter chips. I saw Paula Deen making it one time and thought it looked delicious. 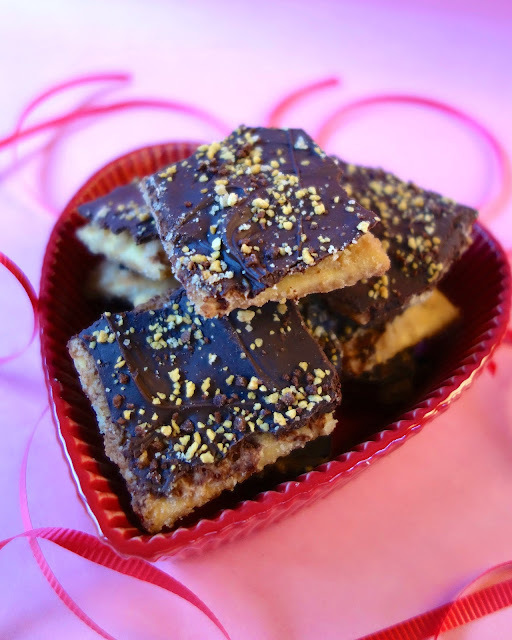 Thanks for reminding me of this recipe in time for Valentine's Day - this stuff is the best ('crack' lol ... I almost snorted diet dr pepper at that!) I made it for our workplace 'sweets week' during the Christmas holidays - very few people guessed the base was saltines :-) I've heard it's good with ritz or townhouse crackers too, but haven't tried it yet. Just DON'T use a cookie sheet - unless you want the goo all over the bottom of your oven! Use a pan WITH SIDES. I know this from experience! And yes, it's CRACK! Soooo good! I made these Sunday using Trisha Yearwoods recipe. We love these. They are very rich! They were easy, & I enjoyed making them!!! I had saltine cracker toffee once, loved it!!! well all i am waiting on is for them to cool. some of it burned but that is ok . my husband will noless eat that part!! he love things on the brunt side. This sounds so good. I like salty/sweet/chocolate. Thanks for sharing. We are having a party at Tumbleweed Contessa - What'd You Do This Weekend? This would be a hit. I'd love it if you would bring this over. Have a sweet week! The Contessa. I make this every year at Christmas. We call it Butter Brickle. I made the mistake once of substituting one of the sticks of butter with a stick of margarine because I didn't have a second stick of butter... It ended up being too soft - halfway between a caramel and a toffee- so I just melted the chocolate chips on top, let it harden in the fridge, and then peeled off the foil and coated the other side with more melted chocolate. It was absolutely ridiculously delish. Should you stir the mixture of butter and brown sugar while it is boiling? Thanks for the recipe! Brooke - don't stir it too much while boiling. You want it to bubble up and caramelize. . I also recommend using parchment paper or something to keep your pan clean. Steph, I have made this twice with chocolate (milk and semi sweet). My husband was not as big a fan as I am. Tonight I made it and instead of chocolate i put mini marshmallows and browned them a bit. Talk about a hit!!! They are amazing!! !